Congratulations to our 2019 winners BASE SexEd, ChirpAlert, and AgAssist! WHAT IS THE IDEAMAKERS CHALLENGE? 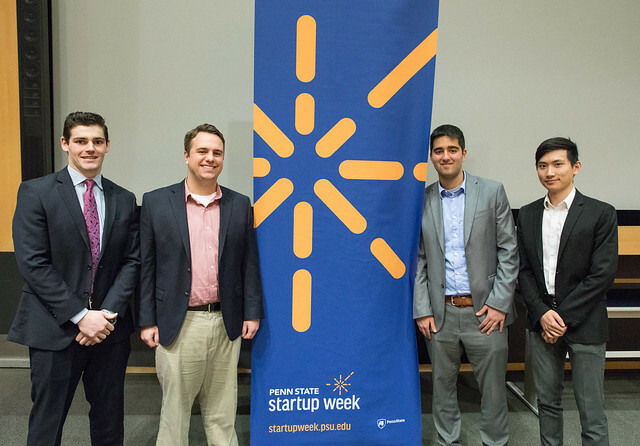 An university-wide challenge held from February-March with a final pitch during Penn State’s Startup Week (Wed Apr 3, 2019). The challenge mentors student teams through the process of pitching their early-stage entrepreneurial ideas to a panel of industry experts. Teams of 2-5 undergraduate students from multiple colleges identify an important problem that can be solved by digital innovation. Teams then receive mentorship from faculty, industry leaders, and experienced entrepreneurs for a chance to win prizes that advance their idea and professional network! This is an idea pitch and not a business plan competition, so this is for teams in the early stages of figuring out how to solve a big problem. A primary requirement is that the solution must leverage information technology as a key component of the business model. This team won the 2018 IdeaMakers Challenge and they will talk about their entrepreneurship experiences and lessons-learned. The speakers will address the student teams and audience while the judges deliberate and select the winning teams. Any undergraduate student currently enrolled and in good standing at Penn State is eligible to participate. Teams must have a minimum of 2 students and a maximum of 5. Teams can be new teams or existing teams who are already working on a problem, but you should still be in the preliminary exploration of that problem. Need help finding a team? See the TeamFinder page to request or search for teammates/ideas. To encourage interdisciplinary collaboration, teams should have members that represent at least 2 different colleges at Penn State. Are you a double major? Pick one college to represent. Each team will have 3 minutes to pitch their ideas with a very short Q&A with the judges. The top teams will advance to the final round. Finalists will be paired with experienced entrepreneur and industry mentors who will help teams advance their ideas and prepare for final pitches. Finalists will have 5 minutes to pitch their ideas and 5 minutes to answer questions from the judges during Penn State's Startup Week event. a prize, which will be announced at the IdeaMakers Final Pitches! Prizes will help teams build their professional network and advance their idea! Do you want to participate, but you don’t have a team? Do you need team members from other colleges? Check out our forum to find other interested students from across Penn State. Applications closed on Sunday February 3, 2019 @ midnight. But check us out again in January 2020!